Making his début on BIS only two years ago, Yevgeny Sudbin has had a uniquely successful start to his recording career. His Scarlatti recital (BIS-CD-1508) earned him universal praise: 'performances of a superlative vitality and super-fine sensitivity' wrote The Gramophone, while the French magazine Piano rejoiced over 'a pianist of the highest class, in complete control of his means and in possession of a charisma and a command which is all to often lacking in musicians of his generation.' A year later this impression was confirmed, as Sudbin's Rachmaninov programme (BIS-SACD-1518) reached the reviewers: 'From beginning to end, we are in the presence here of a major, world-class artist - a fearless technician with an all-encompassing command of his instrument; a musical dramatist of exceptional acumen and sophistication; a poet who moves seamlessly between unbridled rhetoric and extreme intimacy; a stylist who catches the particular spirit of everything he plays' wrote Piano Magazine, UK. Now, at last, comes Yevgeny Sudbin's first concerto disc - and what a disc! With Tchaikovsky's and Nikolai Medtner's Piano Concertos Nos. 1, he brings together one of the world's most famous musical works with a concerto that may not have the same mass appeal but by the initiated is considered one of the finest examples of the genre. In his personal and deeply engaging liner notes Sudbin discusses these two contrasting works, talking about 'the hidden, sometimes almost impressionistic colours that are waiting to be discovered' in Tchaikovsky and 'the unique symbiosis between Medtner's natural feel for the form and its usage, which shows Western qualities, and the emotional intensity with its aristocratic poise, which indisputably speaks in the Russian language.' Supporting Sudbin is the Brazilian team of São Paulo Symphony Orchestra and conductor John Neschling, acclaimed for colourful interpretations of music by their countrymen Camargo Guarnieri and Francisco Mignone. 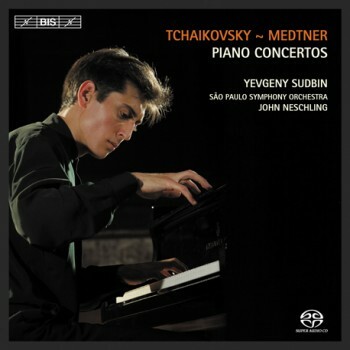 The disc closes with an encore - Yevgeny Sudbin's own transcription of the Medtner song Liebliches Kind ('Enchanting Child') for solo piano.